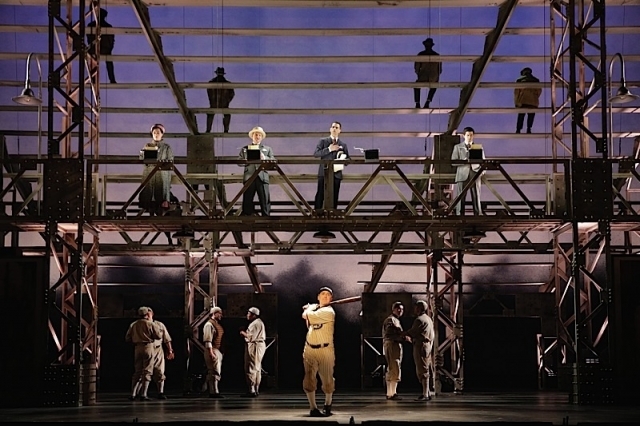 You can catch a comic opera in Minneapolis and a heavy opera in St. Paul, each of which pull no punches in exposing corruption of 100 to 110 years ago. The former regards British bureaucracy when aristocracy defined and ruled and the latter a century ago in American baseball. 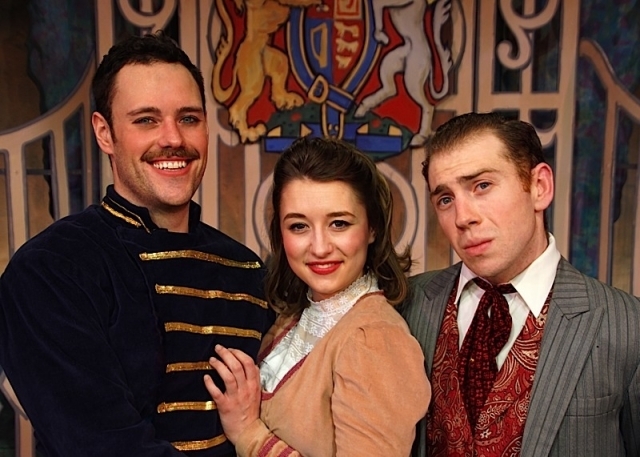 The Gilbert & Sullivan Very Light Opera Company has risen to the challenge of The Mikado, one of the most problematic of comic opera classics. When the piece was first produced in the 1880s during the reign of Queen Victoria, and in subsequent decades, it subversively veiled its British political satire with a Japanese setting with Japanese characters. This could be interpreted as counterproductive to its progressive message as it led to what been considered to be regressive characterizations by Caucasian performers that were considered “yellowface” portrayals, therefore, racist. However, Rick Shiomi, the celebrated co-founding director of the renowned Theatre Mu, appreciated and honored for its roots in Asian performance traditions, adapted The Mikado in terms of the British power structure —not the Japanese—that Gilbert and Sullivan were resistant to satirizing outright for fear of censorship and punishment in their own kingdom. 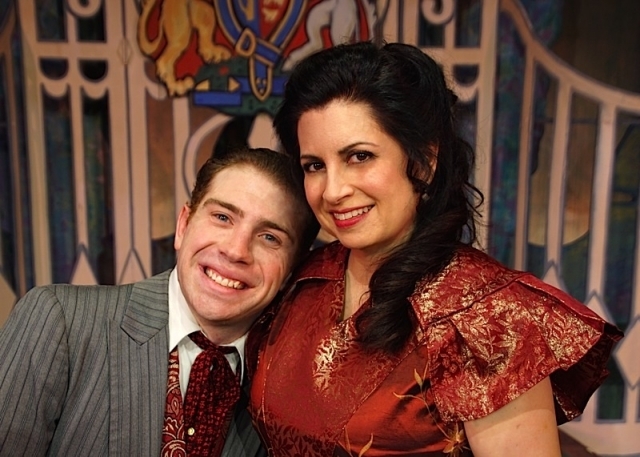 The absurd threat that The Mikado invokes is that flirtation is to be punished by beheading. Though The Mikado was created in the erotophobic Victorian Era, Shiomi has re-set it a bit later circa 1910 in Edwardian England, when those erotophobic attitudes were still pretty much still intact. Shiomi has directed his adaptation in a vibrant production at the Howard Conn Fine Arts Center with a GSVLOC cast that is largely Caucasian in appearance. 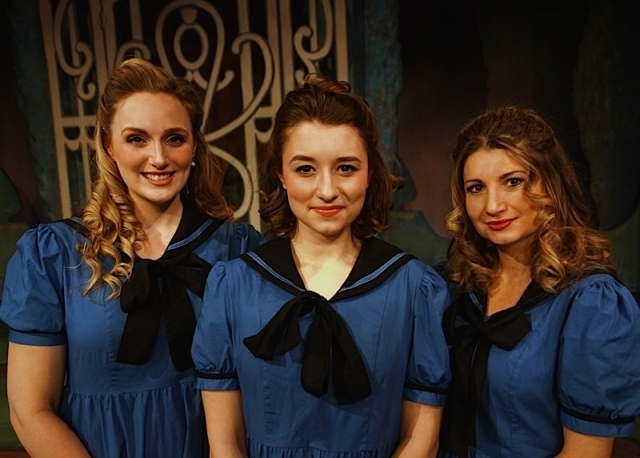 The performers, costumed by Barb Portinga in lovely period style, classically render their roles with an agile and heightened sense of comedy that had the audience the night I saw it in stitches. It excels as music theater in crucial areas; strong vocals, skillful acting, and manifesting the look and style of an era—something Shiomi has long demonstrated a directorial sensibility for. Larry Rostand’s set and scenic design charmingly reflects an old English look. Moreover, something emerges from beneath the madcap surface. The idea of execution as a punishment for minor crimes is itself put on trial by the audience. By The Mikado taking that dictate to outrageously silly extremes, it makes us laugh our way into reflecting on the importance of punishment being meted out in reasonable proportion to a particular crime itself. This comic opera has added relevance in a decade when zero tolerance attitudes have sewn confusion and fomented paranoia in human relationships. Not to mention, contemporary impressions of beheading. The title role refers to the Emperor of Japan. For Shiomi’s purposes he becomes the King of England, which Doug Freeman portrays well with the autocratic sense of entitlement the character signifies. Tyus Beeson and Alex Kolyszko are masters of vaudevillian-style mischief in the major roles of Co Co, the High Executioner and Pooh-Bah, Lord High Everything Else. Their names and titles themselves tell us much about the disdain G & S had to have felt and these two singer-actors pull out all the stops. Lara Trujillo sparkles with haughty flair as the vengefully volatile Lady Katherine Shaw. The comic timing of the entire ensemble is terrific. That element of timing itself is something built right in to a Gilbert & Sullivan work. There’s a comedic rhythm to the music and lyrics, that gallops and frolics, setting the pace. Music Director Randal A. Buikema’s orchestra absolutely revels in this to perfectly stirring and bubbly effect. The voices of the large cast are uniformly rich and lusciously full. 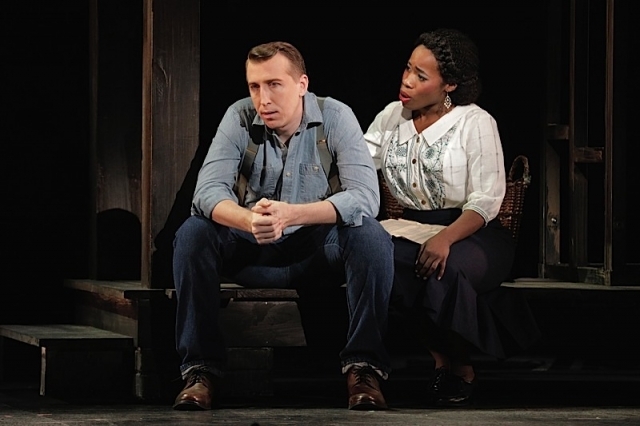 In bold contrast there’s weightier fare with a multiracial cast playing characters who were actual Caucasian persons a century ago in Minnesota Opera’s The Fix. This impelling new work relates the 1919 major league baseball scandal where a group of disgruntled Chicago White Sox players were paid a seductive sum to throw the game. It became to be known, in a play on words, as the Black Sox Scandal. Composer Joel Puckett’s music is evocative in its mix of the transcendental and the forlorn. Ghostly shades of Bernard Herrmann, Ralph Vaughan Williams, and Claude Debussy are spirited beautifully through an orchestra conducted by Timothy Myers. This is one of those operas where you can just bathe in the waves of the music. Librettist Eric Simonson wrestles with problems of how we idealize those who are imperfect and how guilt eats the soul. This manifests in the character of journalist, Ring Lardner. A magnificent Kelly Markgraf infuses his splendid lyrics with spiritual yearnings for men to approach the divine as they integrate their body and psyche. The athlete emanates such an archetype in Lardner’s mind’s eye. He echoes Hamlet’s phrase “What a piece of work is man!”—said not in the ironically disparaging way it often is today, but in supplicating exaltation. 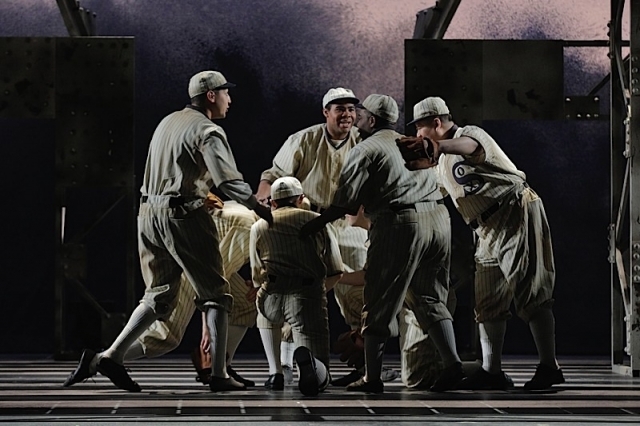 Joshua Dennis probes the guilty conscience of protagonist “Shoeless” Joe Jackson. He exudes a searing pressure of conscience that is utterly palpable. Simonson and Puckett have shaped a representation of the common man brought down by his tragic flaw, which Dennis delivers with true authenticity. He is poignantly matched with the powerful Jasmine Habersham, the devoted wife who is genuinely horrified by the corruption that has entered her husband’s life, therefore, her life as well. 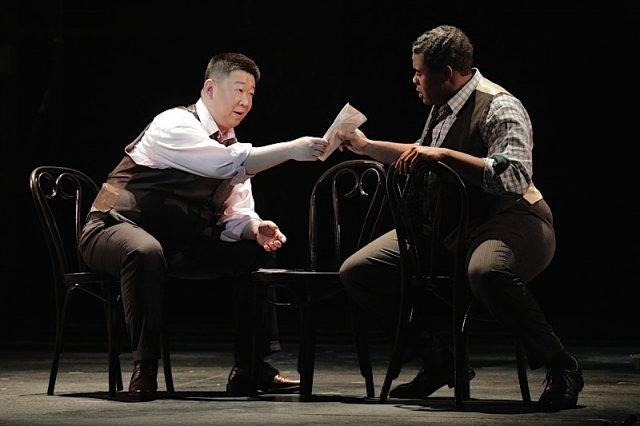 The first-rate Wei Wu, who charmed in Minnesota Opera’s recent Italian Straw Hat is beguilingly different in The Fix as the intimidating Arnold “Chick” Gandil. He is a standout among a whole acting-vocal ensemble that sings marvelously and manifests the images of the era vividly. Simonson, also the director, marshals all elements into a grimly beautiful vision. Sepia tones in Robert Wierzel’s lighting, Trevor Bowen’s well observed period costumes, and Priscilla Bruce’s striking hair and makeup alchemize toward a kind of aching beauty that lives somewhere beyond mere nostalgia. This is enhanced by dreamy slow motion movement moments choreographed by Heidi Spesard-Noble. 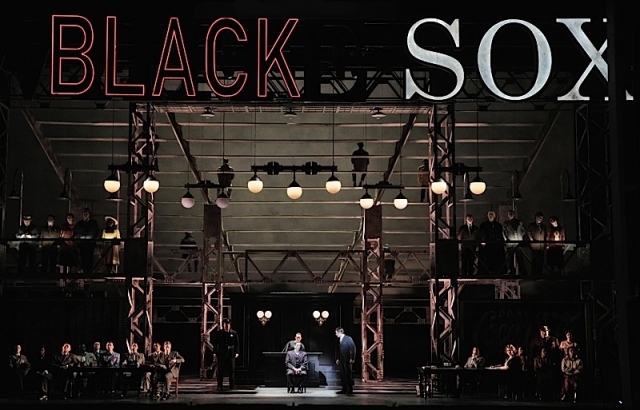 Walter Spangler’s set, in which the back of high rise bleachers dominates the whole expanse upstage is stunningly symbolic as the flesh and blood actions surrounding The Fix play out below and behind the bleachers by real singer-actors. This humanity is juxtaposed with mannequins representing fans in the stands who see only the game, and not the machinations behind the scenes. We are called on as an audience to look at what lies beneath the surface of what we think is social reality.